An infinite number of sensors have been integrated into machine fleets and could stream sensor data continuously. However, they supervise machine operation without being stored or analysed. That data is the fuel of the future and your basis to start digitalization today. The increasing availability of data down to a component level provides new opportunities for system monitoring and prediction. System performance and failures become predictable. Anomaly detection and enhanced system understanding are just some examples. The field of application for time series analysis of industrial processes is huge. Recorded time-series allow to search for relevant machine operation patterns and to compare between different machines of the similar type. The life- and service cycle of each machine becomes transparent. New, prediction-based service strategies, quality monitoring devices and operation event diagnosis systems will be put in place and the market will challenge each manufacturer on his performance. Companies will require the specific know-how to implement self-learning data analytics, pattern recognition and prediction for their machines. How to benefit from this potential, however, is largely unclear in the industry. The challenge is to discover the relevant cases and define use cases. 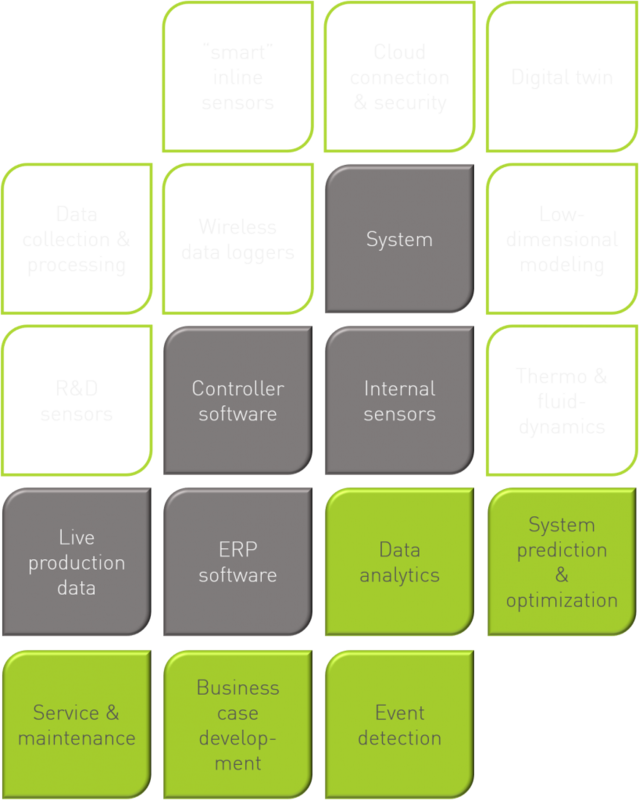 Knowledge about the process itself, relevant sensors and data handling need to be combined with experience in data transmission, storage and finally digital analysis. We are convinced that machine learning is revolutionizing industrial processes, we firmly believe that a sound knowledge of the physics, the operation and the product life cycle is still required and will be so for a long time. Internal resources are usually not sufficient to realize such projects. Off the shelf solutions are, on the other hand not available, since all processes are different and the relevant business case for each case needs to be developed. streamwise capabilities allow to start now the development of tomorrow’s business and digitalization strategies and the data driven analysis of your machine over its entire life-cycle. we partner with state-of-the-art digitalization platforms to provide competitive connectivity, data streaming and cloud storage. streamwise provides tailored analytics to your specific machine process and beneficial business applications. The impact of data-driven analysis and the power of self-learning algorithms on technical equipment can be dramatic. Even in relatively small systems, performance parameters and events are detected that would remain hidden from a conventional physical analysis. streamwise has developed an approach to exploit data analytics starting from your current situation and includes consulting and development of data science projects. Centered around your system which already might have internal sensors, a controller software and possibly first live production data we arrange our digital analysis building blocks as needed. In our opportunity workshops we work with state of the art methods and adapt to the technological ecosystem & requirements of our clients. Our data analytics approach enables a full data-driven understanding of your system under investigation. Furthermore, it opens the possibility to optimize it’s performance, predict it’s behavior and detect abnormal conditions. We develop predictive, descriptive and decisive models and select the right algorithm for your specific life cycle solution. We focus on the development of tailored solutions in the areas of event classification, anomaly detection, statistical inference based optimization, database architecture and improvement of machine-learning algorithm accuracy. Central to the streamwise approach is a product life cycle analysis with a digital focus, as prediction and prognostics on machine level data is a key capability for OEMs and allows new business models for your machine services. defines valuable predictive services and increases quality and life-cycle performance. Also the comparison and learning from the machine fleet with pattern detection will generate valuable service events and improve operations. New monitoring and diagnosis systems based on data analytics will supervise the machine performance for your benefit.